I am quickly adding this America’s Got Talent topic. I am running a bit late today. I apologize for this. Last week’s premiere show was brilliant, wasn’t it? 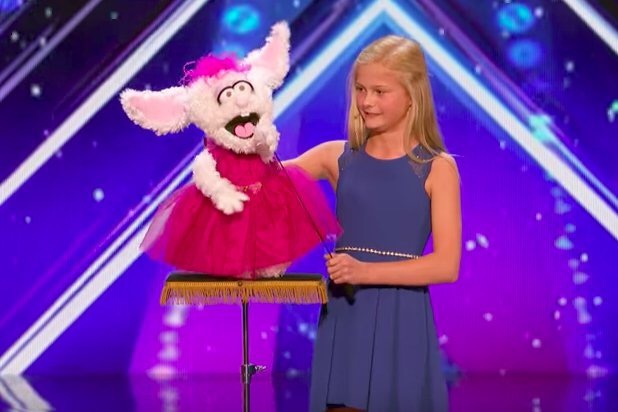 That amazing 13-year-old ventriloquist, Darci Lynne, was one of the best acts I have ever seen on this show. The. Best. I was beginning to think ventriloquism was a lost or dying art. Leave it to a child to instil some new life into this skill and katapult it to new heights. What a talent! And such a personable young lady. As sweet as homemade apple pie. And kudos to Mel B for adorning her with the Golden Buzzer award, thus assuring that Darci will head straight away to the live shows later on in the season. America’s Got Talent airs Tuesday, May 6th at 8:00 PM. Words cant even express how moved to tears i was over that awesome performance. Even her tears of joy at the end just killed it for me….. I so agree about the art of ventriloquism, to do it is one thing, but to sing like that is just another……. We saw Terry Fator go on to win, this gal has every chance also…….. And I am hoping that moving forward each show for her tops the first….. Kudos to Mel B. also…….. Loved it…….. I was floored by Darci Lynne. Astonishing talent! She’s only been doing it for 2 years. Unbelievable! The Best for sure!! !